You know, I had no intention of making these, they weren't some long thought out and planned design that I'd had in my head for ages and agonised over getting just right, these just sort of happened on their own, when I was practising making some butterflies and just happened to have a tray of brownies nearby. After making these butterflies, I decided that they were too small and made some bigger ones and then decided that the bigger ones were too big and reverted to using these ickle bitty ones. The butterflies need to have a day to harden so that their wings can set and it is a good idea to bake the brownies a day before you stamp them out, so that they cut better. I always use this recipe from the Hummingbird Bakery cookbook for making any brownies that I want to stamp out shapes from. It make a deliciously dark, fudge dense brownie that cuts out easily without too many crumbs. It is best if you leave it for about 24 hours before cutting out the shapes and if you the weather is warm, you may want to put it in the fridge for 30 minutes or so before cutting. The butterflies are cut out using a butterfly cutter from the Patchwork Cutters Butterflies, Ladubirds and Bees set. When I bought these the man in the shop said to me that these are not cutters - they are embossers and this is partly true. If you roll out your gum paste really thin, the patchwork cutter will cut through the paste, in practice I find my paste is usually part cut, the cutters are good value for money and I like the effect they give, so I think they are worth a little extra effort. 2. 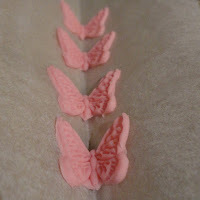 Roll out your petal or gum paste really thin. I use the 9" rolling pin from Wilton with the pink guides attached. 4. If the cutter hasn't cut all the way through the sugar paste, use a cutter or cutting wheel to cut out the shape. 6. Fold the cardboard into a V shape and line with greaseproof paper. Moulding is one of those things, where some days your luck is in and other days, not so much. 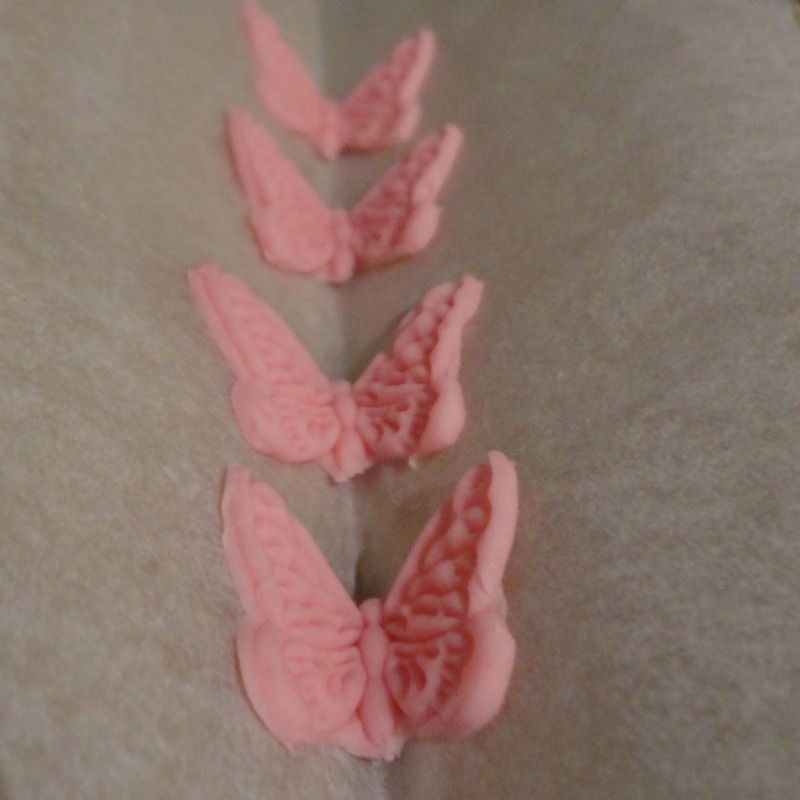 Today was a good day for me and even using plain fondant (rather than modelling or gum paste) these just popped right out of the moulds for me. It was rather cool in my kitchen, so that probably helped. If you are not having such a good day, then check out Karen's moulding video here for some tips. If all else fails and you don't have, or want to use lustre or modelling paste, just pop the mould with the fondant in it into the freezer for about 15 minutes. It is then guaranteed to pop right out, you will though need to leave it for about a day to thaw and dry out a bit afterwards. 5. Use the same cookie cutter you used to cut out the brownies to cut the moulded fondant to the shape. Finally assemble all your bits together. Start with the brownie bottom side up, spread with a little edible glue or piping gel and gently press the moulded fondant on top. Finally attach the butterfly. You kind of need to push his or her little bottom into the fondant to get then to sit at a nice angle.